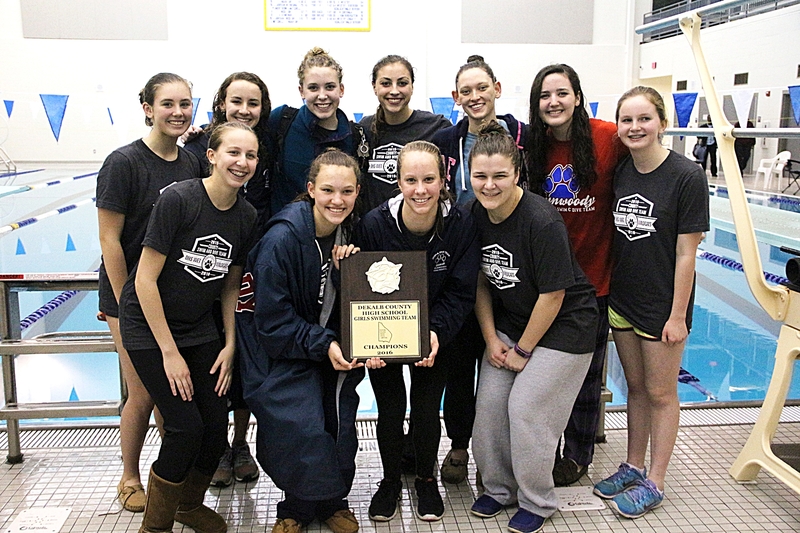 The Chamblee Bulldogs and Dunwoody Lady Wildcats successfully defended their DeKalb County Swimming and Diving titles on Thursday night at Chamblee High. 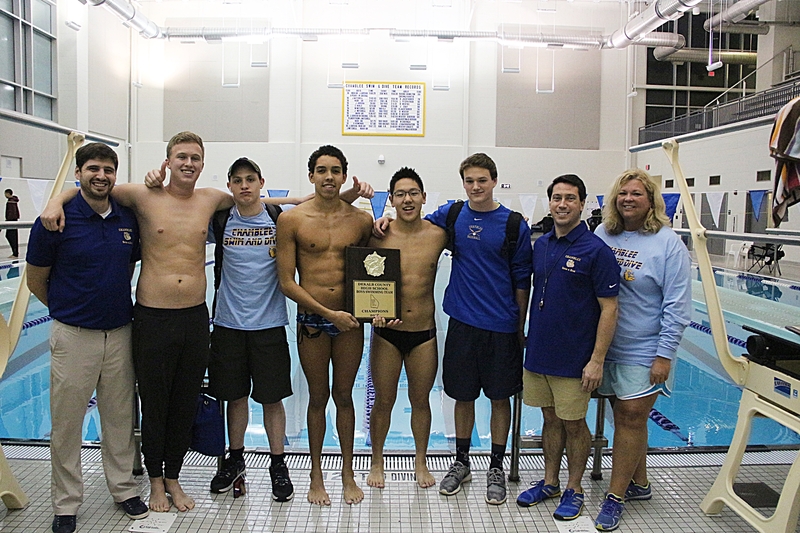 The Bulldogs grabbed nine gold medals and 12 medals overall (2 silver, 1 bronze) in swimming to a 264-216 win over Lakeside to win their fourth consecutive championship and fourth overall. Prior to this four year (2013-2016) run the Bulldogs had finished second nine times, the last coming in 1999. Dunwoody was third with 179 points and Decatur was the only other team with over 100 points with 137 for fourth. 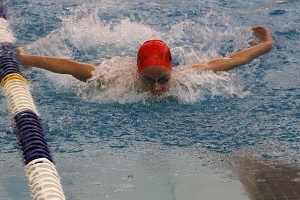 Chamblee had three swimmers double up on gold medals to account for six of the gold medals brought in by the team. Liam Bell set a record in the 100 yard breaststroke breaking the 58.64 record of Lakeside’s Justin Wingo (2000) set 17 years ago with a time of 57.60. He had earlier won the 200 yard individual medley with a time of 1:56.29. 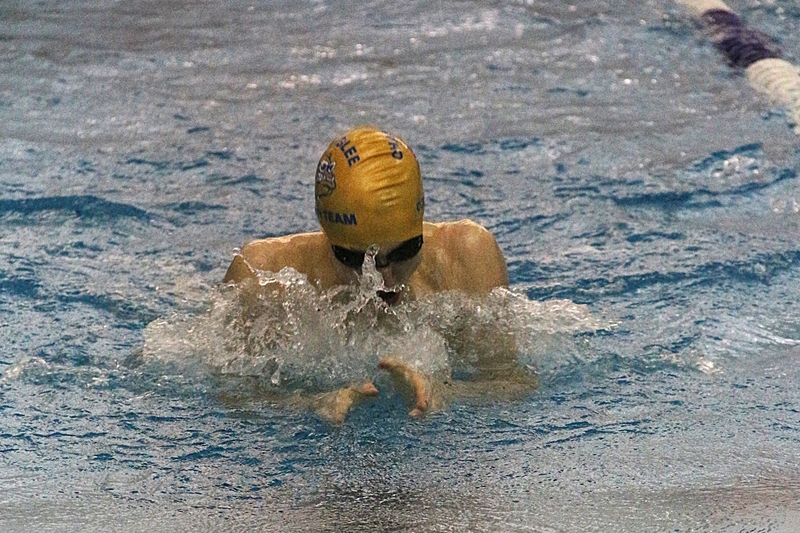 Chamblee’s Liam Bell claimed the DCSD record in the 100 breaststroke (57.60). Noah Oh doubled up in the 200 freestyle (1:43.51) and 500 freestyle (4:47.40) for the third consecutive year to make him an eight-time DCSD individual champion that includes the 2013 and 2014 100 yard freestyle titles. John Mitchell swept the speed events taking the 50 freestyle (21.15) and 100 freestyle (48.86) to go with a gold in the 100 in 2015 to become a three-time gold medalist for the Bulldogs. The Bulldogs have dominated the relays for the past five seasons winning the 200 medley relay and 400 freestyle relay all five seasons and winning the 200 freestyle relay for the fourth consecutive time. Louis Cardot, Liam Bell, Alex Perry and Theo Hardy put together a gold medal winning time of 1:40.44 in the 200 medley relay to start this year’s event and extend Chamblee’s winning streak in the event to five. Dunwoody’s Christopher Thames set a new DCSD record of 51.15 in the 100 backstroke. Oh, Perry, Bell and Mitchell combined for a time of 3:25.16 to give the Bulldogs five straight gold medals in the 400 yard relay while Alexander Miretsky, Oh, Hardy and Mitchell captured the Bulldogs fourth consecutive 200 yard relay with a time of 1:31.03. Dunwoody’s Christopher Thames won his second straight gold medal in the 100 yard backstroke in a record setting time of 51.15. He broke the record of 51.46 set by Tucker’s Cash DeLoach in the 2014 championships. 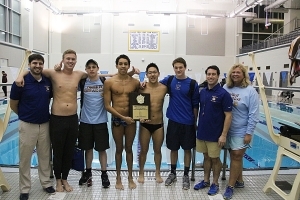 Lakeside which finished as the runner-up for the fourth consecutive season had a pair of gold medalists in Mark Rotolo in the 100 butterfly (53.65) and Sam Witcher broke a three-year run by Chamblee in the one-meter diving by compiling 368.30 points to take the diving gold medal. Lakeside finished with 11 medals (2 gold, 4 silver, 5 bronze). The boys’ competition combined for 51 state qualifying times and six diving qualifiers for next week’s GHSA State Swimming and Dive Championships at Westminster. The Dunwoody Lady Wildcats collected eight gold medals and four silver medals on the way to their second consecutive DCSD title and 14th overall by a score of 243-207 over Chamblee. Lakeside was third with 187 and Decatur a close fourth with 183. Allie Reiter became a five-time individual champion as she swept the 200 individual medley (2:09.94) and 100 breaststroke (1:07.05) for the second consecutive year. 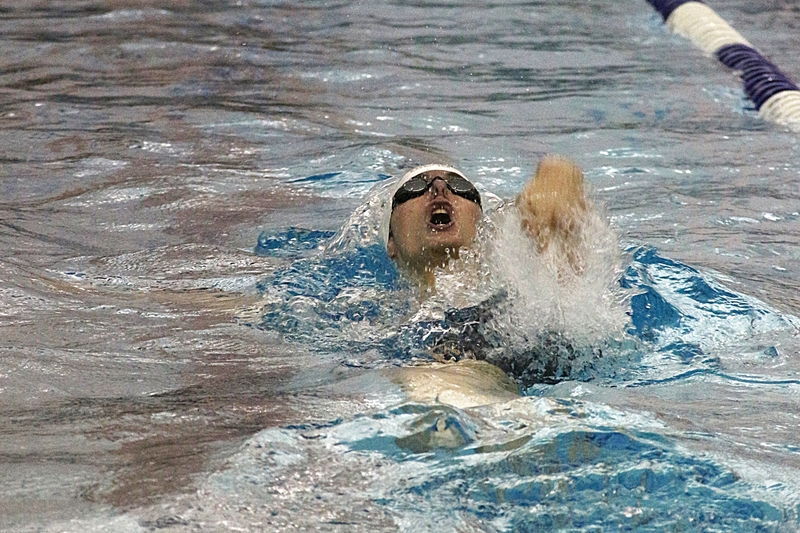 She also won the 2014 breaststroke giving her a three-year streak in the event. Kaleigh McGrady swept the 50 yard (25.18) and 100 yard (55.12) freestyle speed events to make herself a three-time DCSD individual champion having won the 100 a year ago. Abbey Yates claimed her fourth consecutive DCSD gold medal in the one-meter diving by compiling an impressive 430.90 points for the win. The point total was 45 points better than her best in the prior three years. Megan Johnson won her first individual gold medal by taking the 500 freestyle crown with a time of 5:40.24. Dunwoody swept the 200 medley relay (1:54.22) and 200 freestyle relay (1:43.81) for the second consecutive season. It was the third consecutive win in the 200 freestyle relay and the time set by Laura Spratling, Allie Reiter, Hannah Robison and Kaleigh McGrady (the same team that won the medley relay) was just 1/100th of second of tying the record set by Dunwoody in 2014. Chamblee which claimed its only DCSD title in 1985 finished second for the 14th time since the 1971 inaugural event for the girls as the team claimed 11 medals (2 gold, 4 silver, 5 bronze). Julia Von Biberstein won the 200 freestyle (2:04.26) and Jade Foelske won the 100 butterfly (58.81) to claim the two gold medals for Chamblee. Lakeside’s Rachel Hu claimed her first gold medal since her freshman season (2013) in taking the 100 backstroke gold (1:02.66) to become a three-time gold medalist. 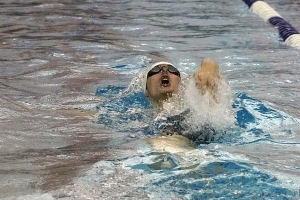 Hu had won the 200 IM and 100 breaststroke in 2013. Decatur’s strong fourth place finish was fueled by the gold medal winning team of Lisa Studstill, Jane Pfeufer, Nadine Abrahamse and Torey Brierley (50 freestyle champ in 2015) in the 400 yard freestyle relay with a time of 3:48.65 to prevent a Dunwoody sweep of the relay events. The girls’ competitors combined for 38 state qualifying times in the meet and seven divers set state qualifying scores.